In May 2009, the Associated Press, aka the Administration's Press, announced that it would be "launching an index that will provide monthly, multi-format updates on the economic stress of the United States down to the county level." Not a bad idea, especially if you were concerned that evidence of an economic recovery under Barack Obama would not otherwise be convincing. The AP likely believed that since an overwhelming percentage of U.S. counties lean conservative (remember those Bush v. Gore county maps? ), a large majority of U.S. counties would likely recover in time for the 2010 congressional elections, or in the worst-case scenario, the 2012 presidential election — even if the nation as a whole did not. A statement that "most counties in the U.S. have recovered from the recession" would have been quite useful in defending congressional Democrats and Barack Obama's incumbency. But a recently released report from the National Association of Counties (NACo), which was covered poorly by the Wall Street Journal and virtually ignored by almost everyone else, shows that it hasn't happened. My bet is that AP realized the poor county-level progress in the spring of 2011, saw that things weren't going to get better any time soon, and decided to abandon the project for that reason. The Associated Press Economic Stress Index weighs three economic variables – unemployment, foreclosures and bankruptcy – to produce a score on a scale of 0-100 that measures how the recession is affecting a county compared to all others. Unfortunately, as those who follow the economy have painfully learned, relatively few counties anywhere recovered in time for the 2010 congressional elections. In May 2011, when it was clear that meaningful improvement still had not occurred and would likely not be evident in even a majority of counties in time for the presidential election, the AP produced its final version of the map. About half of the nation’s 3,069 county economies are still short of their prerecession economic output, reflecting the uneven economic recovery, according to a new report from the National Association of Counties. The overall U.S. economy had reached its prerecession level of gross domestic product three years ago, Commerce Department figures show. About 800 county economies, mostly in the South and Midwest, had no drops in employment over the last decade or were above their pre-recession levels in 2013. Since the nation (excluding CT and RI, which don't have county governments) has 3,069 counties, that means that only about 26 percent of the its counties have recovered the employment losses they incurred during the recession — and about 74 percent haven't. Keep in mind that the map shows county-level and not overall state performances. There are only three states (MA, ND, and TX) where over 50 percent of counties are back to their prerecession employment levels. 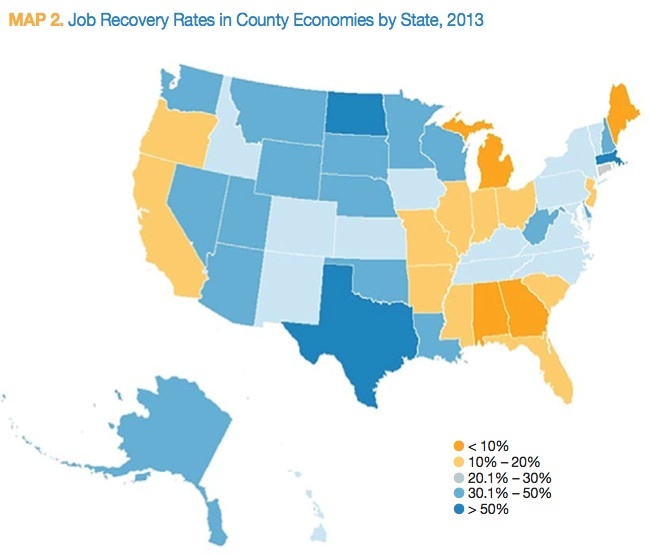 The majority of counties in every other state have not recovered their employment losses. 15 states have seen fewer than 20 percent of their counties return to their prerecession employment levels. This performance is beyond miserable, and goes a long way towards explaining why the American people aren't at all convinced that there has been anything resembling a genuine economic recovery. As I noted earlier, the AP, whose "Economic Stress Index" calculation leaned heavily on specific county unemployment rates for the majority of its index value, surely saw how bad things were in most of the nation's counties in the spring of 2011. I believe that's why, despite likely devoting quite a bit in the way of resources to launching the project, it decided to abandon it.